Masood Rana Pakistani Filmi Playback Singer. He was great Pakistani Filmi Music Artist, he created great name in Pakistan Music. He began his singing career in 1962 with the Film Inqalab and became one of the top male singers in both Urdu and Punjabi Films for more than three decades. He sung in the highest number of Films and he was a very busy film Singer. Masood Rana sung beautiful Patriotic Songs which became popular and are still played on Pakistan National Days. His popular song was for "Film Aag Ka Darya 1966", Ae Watan Hum Hain Teri Shama Kay Parwanon Main, and he sung "Yaad Karta Hai Zamana Unhi Insaano Ko" in "Film Hamrahi 966". I have selected below most popular great Filmi Music of Masood Rana. Masood Rana was born on 09 June 1938. Masood Rana was introduced by Filmi Director Iqbal Shahzad and Pakistani Filmi Actor Saqi. 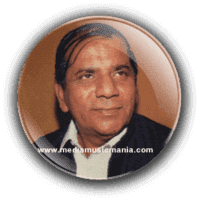 He started his career and His first Filmi Song was Mashriq ki tareek faza mein naya savera phoota hay in Film Inqalab and song was composed by N. K. Rathore popular Music Director. He was proudly introduced as "Pakistani Rafi" and always lived up to his reputation. He specialized in singing difficult songs in very high- pitched voice and was the first choice for music directors for film title and theme songs. Masood Rana was Legendary singer of Pakistan and he was died on 04 October 1995.